As our Internet is getting faster, home networking is a part that should not be overlooked. Imagine you are suffering from poor signal at one spot of your house, you can reuse your existing router to expand the coverage and enjoy all the benefits of a mesh network. 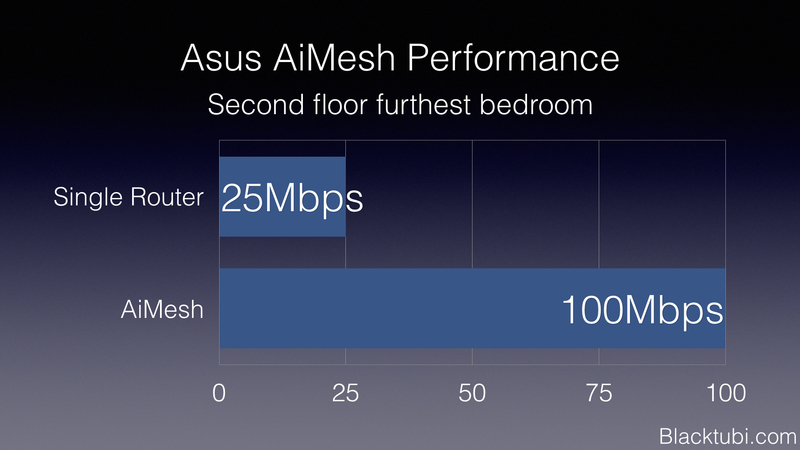 Asus AiMesh is a solution designed exactly for that. 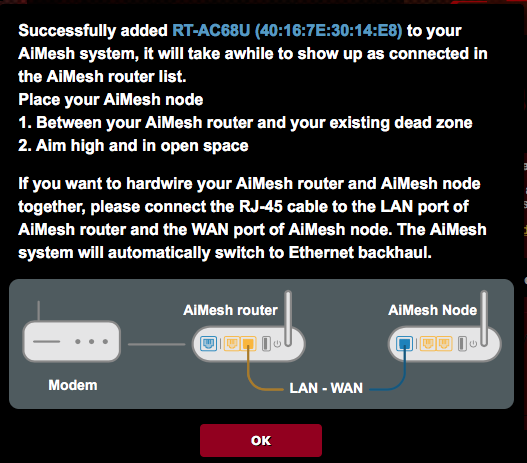 In short, AiMesh allows you to create a mesh network with multiple Asus routers. You also enjoy the benefit of a mesh wireless system where you have centralized control and good roaming performance. Setting up Asus AiMesh is really simple as long as all your Asus routers are running the latest firmware. Maintaining all the routers is really simple as well. All routers are maintained by the main router and that include firmware updates. 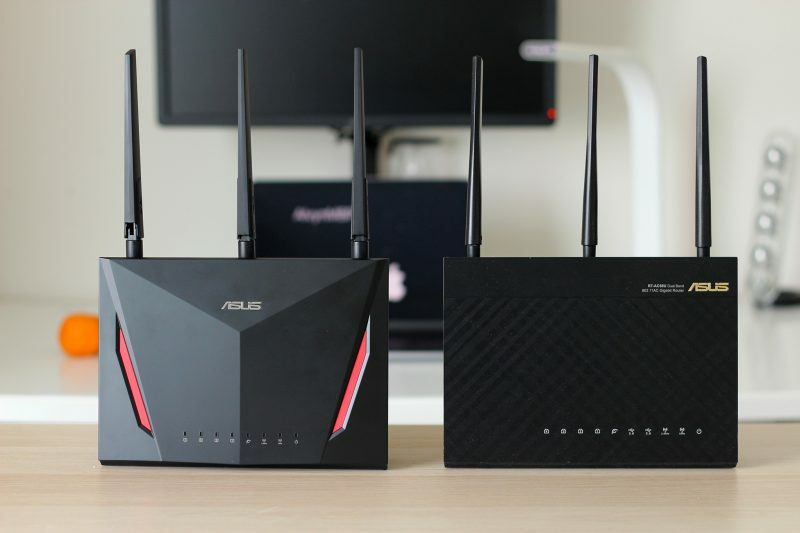 Unlike most mesh systems in the market, you are able to enjoy the full features of your Asus router such as AiProtection and AdaptiveQoS. It also supports a Unifi connection. Another plus point for AiMesh as most mesh networking system in the market offers very basic features and they do not support Unifi. 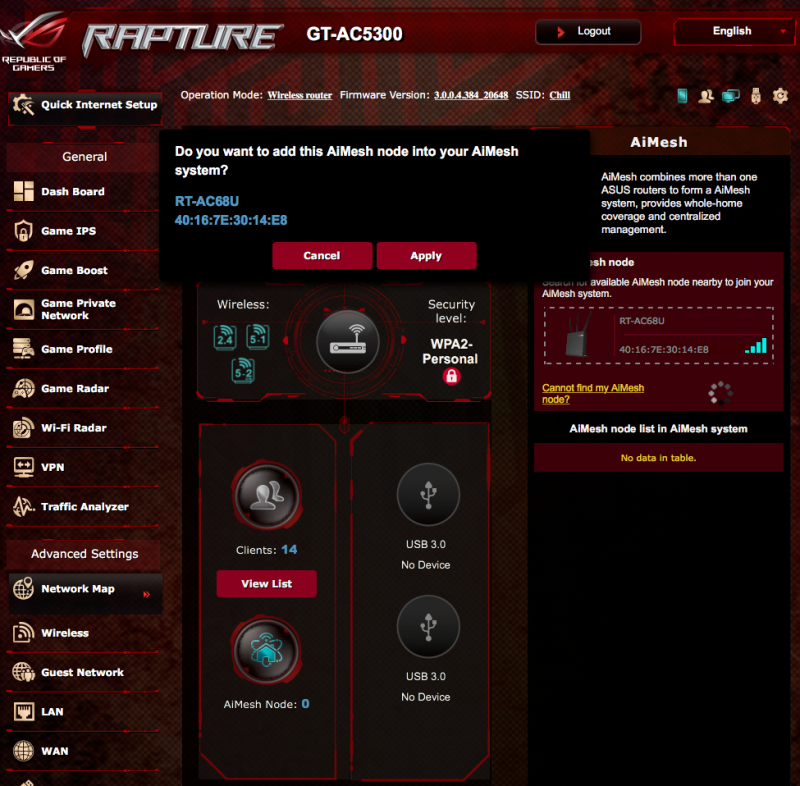 In my demo, I will use the Asus ROG Rapture GT-AC5300 as the main router and 2 Asus RT-AC68U as the AiMesh node. Asus suggests that the fastest router should be used as the main router. Before you start, you have to ensure all your Asus routers are running the latest firmware. 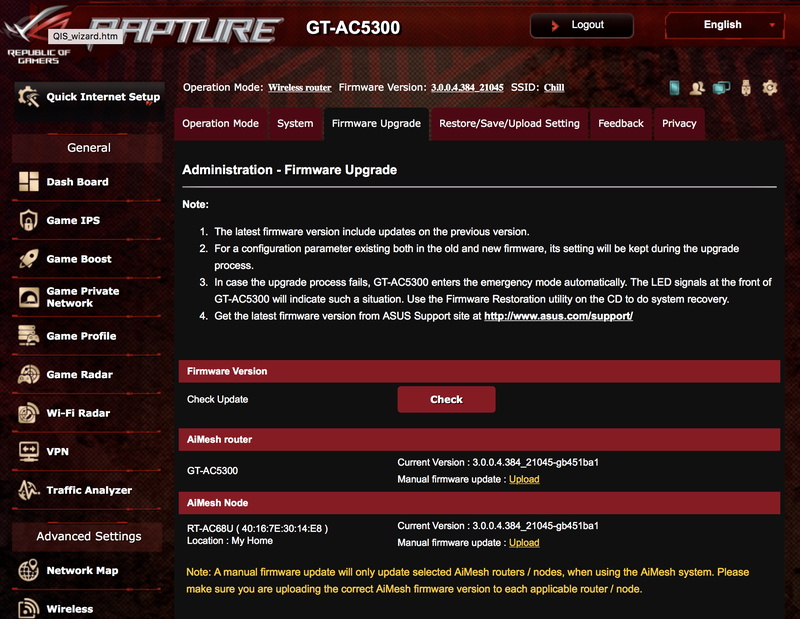 You can do that manually or just navigate to Administration>Firmware upgrade. You have to factory reset your secondary router or known as AiMesh node prior to the configuration. You can do so by using the firmware interface or by pressing the RESET button on the router for at least 10 seconds. Once you reset your AiMesh node, you can turn it on. Make sure you do not do anything or connect it to the main router. Now, you are able to add your AiMesh node to your existing router. 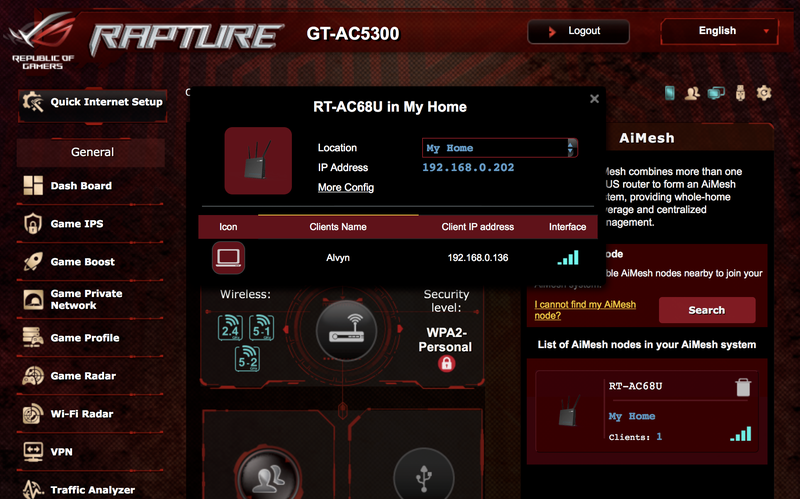 Navigate to the configuration interface of your Asus router and click the ‘Search’ button under the AiMesh tab. Once you saw your AiMesh node, click add. It will take some time for the main router to configure the AiMesh node. Once it is done, it will prompt you a message and reboot the AiMesh node. In order to gain the best performance, the placement of your AiMesh node is really important. Your AiMesh node need to hear from the main router before extending the network. With that, you should place your AiMesh node at somewhere with at least decent connection. In my quick test, I will compare this AiMesh setup against a single router setup consisting of the ROG Rapture GT-AC5300 router. This is a test to demonstrate the efficiency of AiMesh as I am aware that certain mesh wireless system cannot even reach 100Mbps on mesh mode. 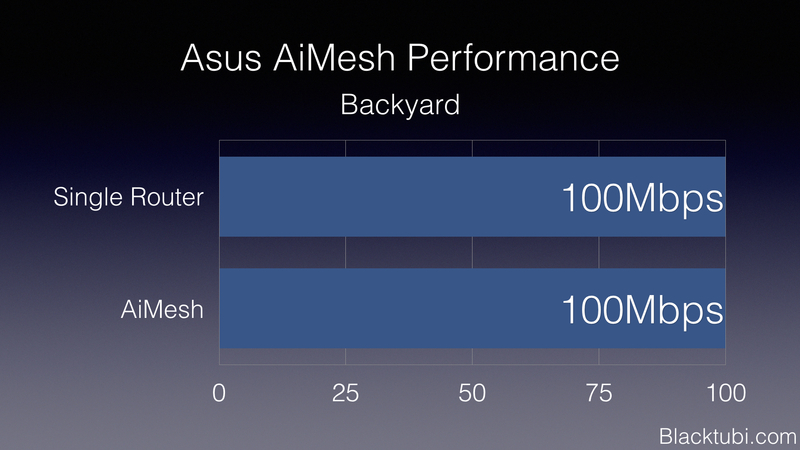 From the results, it is clear that Asus AiMesh passed the test. I will perform a further test in the next article to actually determine the max capacity. This is going to be a typical case of wireless connectivity woes. A lot of people always have issues with wireless connectivity in the third floor of their property. While I do not have access to such a property, this should be able to display how a mesh system will help. From the results, by placing the AiMesh node on the hallway of the second floor, the furthest room at the second floor is able to enjoy the full 100Mbps Internet performance of my home network. This case will be on an extreme situation as I always face issue with wireless connectivity in this bathroom. This bathroom is furthest from the router and thanks to the the enclosed nature of how a bathroom is constructed, it is really hard for wireless signal to get through. I can hardly even maintain a consistent connection in here, not even on 2.4Ghz if I do not use any network extension devices. However, with an AiMesh node placed at the second floor, I am getting decent speed. This shall be a good case study for those planning to improve their coverage on bigger properties. Asus AiMesh is a great feature from Asus. It is easy to setup and it provides another use for your old Asus routers shall you decided to upgrade your router to a higher end model. It also works pretty well as a mesh wireless system with solid performance. Like all new features, it is not perfect now as there are still some bugs in the mesh system but it is nothing serious. I am sure Asus will iron out all the imperfections soon considering the feature has received countless updates since the official debut. Stay tuned for our upcoming article in the series for a deeper dive into Asus AiMesh. We will have a more in depth performance testing, roaming and latency benchmark. Can I connect wirelessly non AiMesh router as AiMesh Node to the an AiMesh router? Or it will act as normal repeater? Only AiMesh system can work with each other to form Mesh WiFi. Hi, 2 units of ac68u of Aimesh is better or mesh system such as blue cave/tp-link mesh is better? 2 unit of RT-AC68U is good. 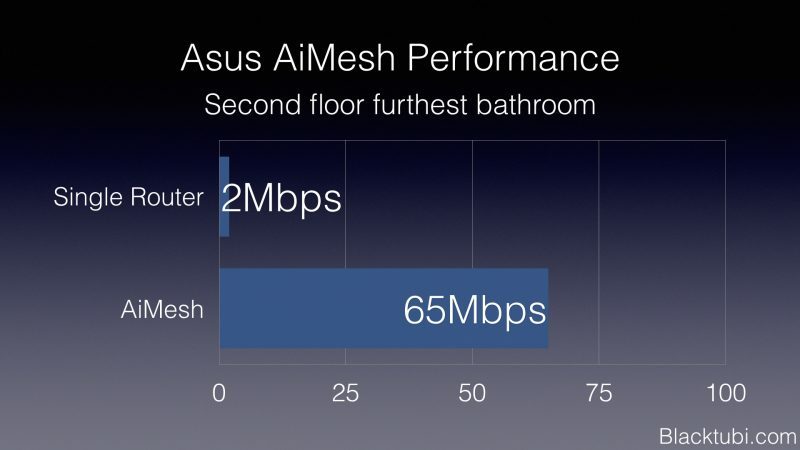 In the light of Unifi turbo speed up to 800Mbps, do you think getting one high end router like Asus RT-AC5300 or setting up AiMesh with a slightly lower tier router like AC86u with another Asus router is better. My house is a 1500+sqft double storey terrace, typical terrace with lots of walls, maximum number of devices is around 10 and all of them on WiFi. I would prefer the RT-AC86U AiMesh solution. Due to the nature of wireless, as the range get further, the maximum throughput is limited by the wireless capability of client device. An AiMesh solution is able to fix that as both routers have much better wireless ability and thus able to provide bigger coverage at better performance.